Dissolve about 10 gm of sugar in 100 mL of water. Take 20 mL of this solution in a test tube and add a pinch of yeast granules to it. Put a cotton plug on the mouth of the test tube and keep it in a warm place. After 1 or 2 hours, put a small drop of yeast culture from the test tube on a slide and cover it with a coverslip. Observe the slide under a microscope. Wet a slice of bread, and keep it in a cool, moist and dark place. Observe the surface of the slice with a magnifying glass. Record your observations for a week. Compare and contrast the ways in which yeast grows in the first case, and how mould grows in the second. Having discussed the context in which reproductive processes work, let us now examine how different organisms actually reproduce. The modes by which various organisms reproduce depend on the body design of the organisms. cell division. In organisms such as Amoeba, the splitting of the two cells during division can take place in any plane. Observe a permanent slide of Amoeba under a microscope. Similarly observe another permanent slide of Amoeba showing binary fission. Now, compare the observations of both the slides. However, some unicellular organisms show somewhat more organisation of their bodies, such as is seen in Leishmania (which cause kala-azar), which have a whip-like structure at one end of the cell. In such organisms, binary fission occurs in a definite orientation in relation to these structures. 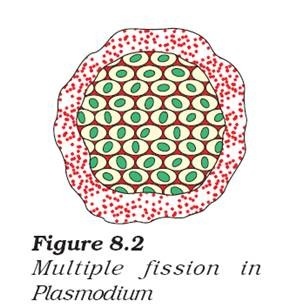 Other single-celled organisms, such as the malarial parasite, Plasmodium, divide into many daughter cells simultaneously by multiple fission. Yeast, on the other hand, can put out small buds that separate and grow further, as we saw in Activity 8.1. Collect water from a lake or pond that appears dark green and contains filamentous structures. Put one or two filaments on a slide. Put a drop of glycerine on these filaments and cover it with a coverslip. Can you identify different tissues in the Spirogyra filaments? In multi-cellular organisms with relatively simple body organisation, simple reproductive methods can still work. Spirogyra, for example, simply breaks up into smaller pieces upon maturation. These pieces or fragments grow into new individuals. Can we work out the reason for this, based on what we saw in Activity 8.4? This is not true for all multi-cellular organisms. They cannot simply divide cell-by-cell. The reason is that many multi-cellular organisms, as we have seen, are not simply a random collection of cells. Specialised cells are organised as tissues, and tissues are organised into organs, which then have to be placed at definite positions in the body. In such a carefully organised situation, cell-by-cell division would be impractical. Multi-cellular organisms, therefore, need to use more complex ways of reproduction. A basic strategy used in multi-cellular organisms is that different cell types perform different specialised functions. Following this general pattern, reproduction in such organisms is also the function of a specific cell type. How is reproduction to be achieved from a single cell type, if the organism itself consists of many cell types? The answer is that there must be a single cell type in the organism that is capable of growing, proliferating and making other cell types under the right circumstances. Many fully differentiated organisms have the ability to give rise to new individual organisms from their body parts. That is, if the individual is somehow cut or broken up into many pieces, many of these pieces grow into separate individuals. For example, simple animals like Hydra and Planaria can be cut into any number of pieces and each piece grows into a complete organism. This is known as regeneration (see Fig. 8.3). Regeneration is carried out by specialised cells. These cells proliferate and make large numbers of cells. From this mass of cells, different cells undergo changes to become various cell types and tissues. These changes take place in an organized sequence referred to as development. 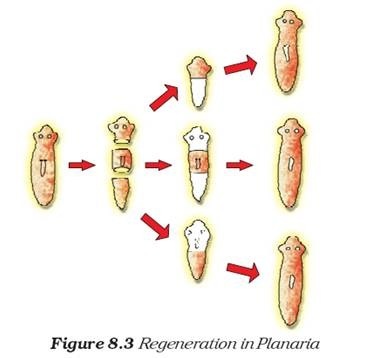 However, regeneration is not the same as reproduction, since most organisms would not normally depend on being cut up to be able to reproduce. Organisms such as Hydra use regenerative cells for reproduction in the process of budding. 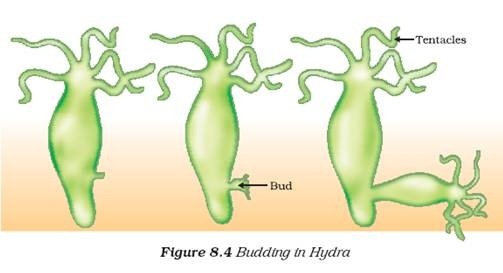 In Hydra, a bud develops as an outgrowth due to repeated cell division at one specific site (Fig. 8.4). These buds develop into tiny individuals and when fully mature, detach from the parent body and become new independent individuals. There are many plants in which parts like the root, stem and leaves develop into new plants under appropriate conditions. Unlike in most animals, plants can indeed use such a mode for reproduction. This property of vegetative propagation is used in methods such as layering or grafting to grow many plants like sugarcane, roses, or grapes for agricultural purposes. Plants raised by vegetative propagation can bear flowers and fruits earlier than those produced from seeds. Such methods also make possible the propagation of plants such as banana, orange, rose and jasmine that have lost the capacity to produce seeds. Another advantage of vegetative propagation is that all plants produced are genetically similar enough to the parent plant to have all its characteristics. Take a potato and observe its surface. Can notches be seen? Cut the potato into small pieces such that some pieces contain a notch or bud and some do not. Spread some cotton on a tray and wet it. Place the potato pieces on this cotton. Note where the pieces with the buds are placed. Observe changes taking place in these potato pieces over the next few days. Make sure that the cotton is kept moistened. Which are the potato pieces that give rise to fresh green shoots and roots? 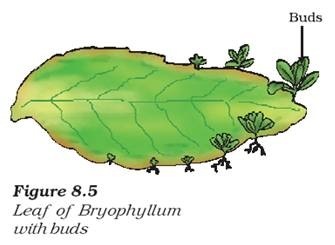 Similarly buds produced in the notches along the leaf margin of Bryophyllum fall on the soil and develop into new plants (Fig. 8.5). Cut some pieces such that they contain at least one leaf. Cut out some other portions between two leaves. Dip one end of all the pieces in water and observe over the next few days. Which ones grow and give rise to fresh leaves? What can you conclude from your observations? In tissue culture, new plants are grown by removing tissue or separating cells from the growing tip of a plant. The cells are then placed in an artificial medium where they divide rapidly to form a small group of cells or callus. The callus is transferred to another medium containing hormones for growth and differentiation. The plantlets are then placed in the soil so that they can grow into mature plants. Using tissue culture, many plants can be grown from one parent in disease-free conditions. This technique is commonly used for ornamental plants. Even in many simple multi-cellular organisms, specific reproductive parts can be identified. The thread-like structures that developed on the bread in Activity 8.2 above are the hyphae of the bread mould (Rhizopus). They are not reproductive parts. On the other hand, the tiny blob-on-a-stick structures are involved in reproduction. The blobs are sporangia, which contain cells, or spores, that can eventually develop into new Rhizopus individuals (Fig. 8.6). 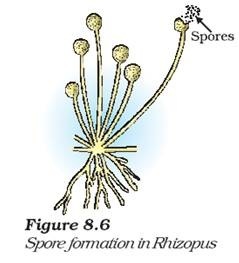 The spores are covered by thick walls that protect them until they come into contact with another moist surface and can begin to grow. All the modes of reproduction that we have discussed so far allow new generations to be created from a single individual. This is known as asexual reproduction.